Eight years together is a wonderful achievement and deserves a celebration. This year is a celebration of your growing relationship and a reminder of the early days of your love. The gift for your love of 8 happy years should be a reflection of the love you have for her. Lilacs are symbolic of everything that your anniversary represents. Celebrate with a fragrant bouquet of white and purple lilacs flowers for your eighth anniversary. Sending flowers that have a significant meaning to you and your loved one makes the arrangement more substantial and meaningful. She will appreciate the thought and care you put into her gift. Lilacs are known for being spring’s flower. Their blooms are a sign of whether spring will come early this year or a bit later. Spring represents new life and new love. Send her the perfect arrangement of lilacs to show her how your love is in spring bloom all year round. Purple and white lilacs are typically sent for this particular anniversary. White lilacs are symbolic of youthful innocence. This is appropriate for your relationship because love is always young and innocent, yours is no exception. 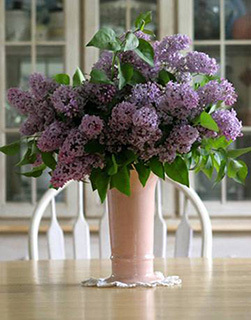 Purple lilacs symbolize the first feelings and emotions of love. This flower is reminiscent of the days you had fallen in love with each other. Lilacs are flowers native to Eastern Europe and Asia. It’s botanical name of this flower is Syringa, which comes from a ancient Greek myth based on the flower. Ancient Greeks believed a nymph named Syringa was being frightened by Pan, the god of all forests and fields. Pan was drawn to Syringa and captivated by her astounding beauty. Being that she was so terrified by him, she ran through the woods to get away from him. He relentlessly had chased her, too hypnotized by her beauty to see her fear. To protect herself from Pan, Syringa had turned herself into a beautiful purple bush we now know today as the Lilac flower. Send the love of your life the most perfect white and purple lilac arrangement. She will appreciate that this bouquet represents her beauty and your undying love for her. Celebrate your love this year with a wonderful lilac arrangement of flowers for your eighth anniversary!